Ratanakiri is located in Cambodia’s far northeast bordered by Laos to the North, Vietnam to the east and Mondulkiri to the south. From Phnom Penh you have to allow around 10 hours by bus. 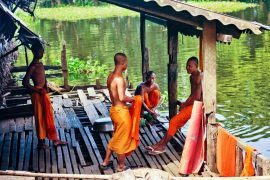 It is one of the least developed provinces of Cambodia, principally due to its remoteness but also it is where the ethnic Khmer make up only a small part of the population. 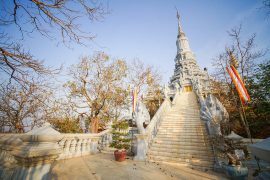 It was occupied for a long time by mountain tribes named “Khmer Loeu” (which means Khmer from the top). These tribes were made up of many ethnic groups with their own languages, traditions and customs. It has a rich geography which is diverse and consists of mountains, plains, forests, jungles, crater lakes and river basins. Nearly half of Ratanakiri is occupied by protected zones such the reserve of Lumphat and the national park of Virachey. Both must see places to be put on your itinerary. The provincial capital is Banlung, called the red city. It is a small city where you can find a number of guesthouses and places to eat. Our favorite guesthouse is the “Tree Top Eco-lodge” offering beautiful rooms made in wood with large balconies, a nice view of the surrounding forest at very reasonable prices. Phnom Svay and the Buddha lying in Rahtanharahm temple, renowned place of pilgrimage just 2km west of Banlung. The vast natural reserve of Lumphat 37km south of Banlung and which extends for over 250 000 hectares. The astonishing national park of Virachey, in the jungle 37km northeast of Banlung. The majestic crater lake of Yak Loum. Four beautiful waterfalls: Cha Ong, Kan Chang, Ka Tieng and Sean Lae located within easy travelling distance from the city. This remote region is an absolute must for nature lovers. You will discover a variety of plants and you may have the chance to glimpse rare animal species such as gibbons. Ratanakiri is like no other place in Cambodia, still little marked by the activity of the man. We highly recommend you take a trek in the jungle for 2,3 days or more to be immersed closer to nature and its inhabitants. It is the best way to discover and understand the ethnic minorities way of life and the province of Ratanakiri. Green Cultural Travel will arrange for a local guide to take you far from the usual tourist area’s and take a trip back in time. However, in Ratanakiri there is one intolerable activity that we ask you to avoid please. Although a ride on an elephant seems like an exciting opportunity this animal is reduced to slavery, spending its day carrying tourists on its back and tortured when they are young to ensure it is domesticated. There are many fine projects to visit in Cambodia where you can interact with Elephants without supporting this cruel industry.